If you get this email purporting to be from Virgin Australia, delete it. The message, emblazoned with Virgin Australia's logo, landed in my inbox late last week and urged me to "hurry up!" and fill out a short survey to be in the running for a $1000 flight voucher. 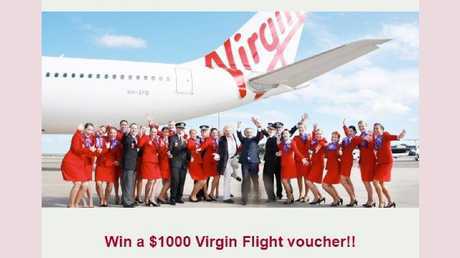 The email had my correct name and featured a charming image of a Virgin Australia crew in front of an aircraft - exactly the kind of promotional shot you'd expect from an airline. To be honest, as much as I could do with the flight voucher, I didn't really intend to follow the link to the survey - I'm a lazy millennial and it seemed like effort. At the same time, I'm just old enough know if something seemed too good to be true, it probably was. I felt something sinister was behind the many enthusiastic faces and double exclamation marks in this email. For starters, the whole vibe of the email seemed a little amateurish from the high standard we can usually expect from Virgin Australia and the entire Virgin group. There was no way billionaire businessman Richard Branson would be behind any correspondence with excessive exclamation marks and a lurid green button labelled ">>WIN<<". Yep, my [emailaddress] was randomly selected all right. There was this little fumble: "your email: [emailaddress] has been randomly selected". 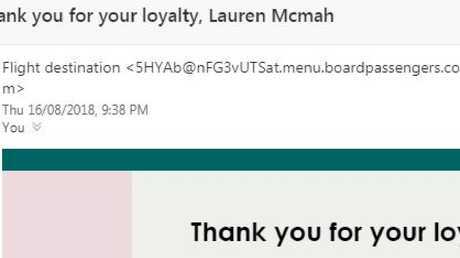 The font didn't seem consistent with the legitimate emails I get from Virgin Australia, and, when I thought about it, I only received promotional emails from Velocity Frequent Flyer and not the airline itself. 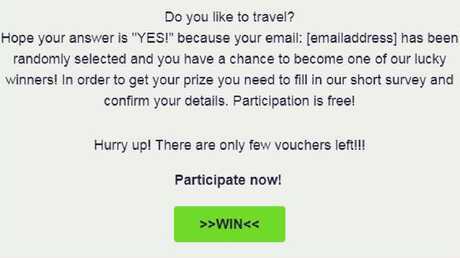 But the number one, most obvious giveaway was the name of the sender, "Flight destination", and the email address: 5HYAb@nFG3vUTSat.menu.boardpassengers.com. Well this looks super-duper legitimate and everything. I didn't want to know what would happen if I clicked on the link, but the email was most likely a basic phishing scam seeking personal information I'd deeply regret putting into the wrong hands. It might seem a little obvious, especially if you're an online-savvy millennial, but people fall for even simple scams like this all the time. Last year, Australians lost $340 million to scammers, including online scams - the highest collective loss since the Australian Competition and Consumer Commission began reporting on scam activity. 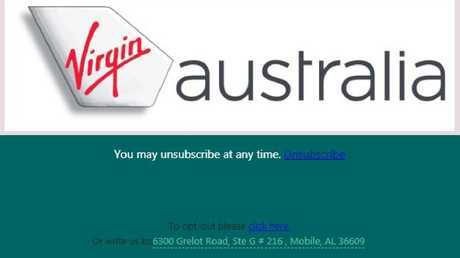 To opt out, you can totally write to Virgin Australia at its address in ALABAMA. In the past month, British Airways has been the target of a "free ticket" scam circulating on WhatsApp. Singapore Airlines was warning its customers of a similar scam just a few months back. 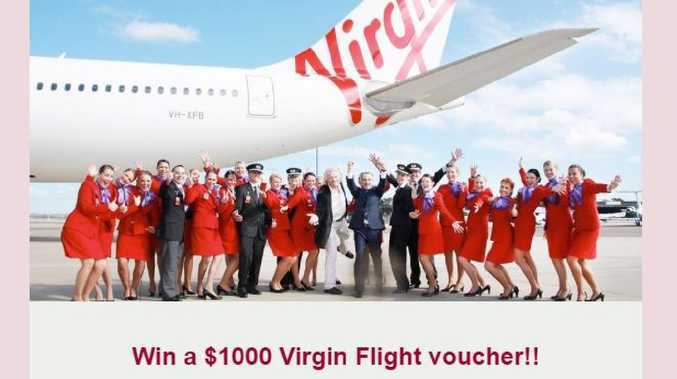 So if you have found that tempting offer from "Virgin Australia" has also arrived in your inbox, delete it, and try not to think about how much you could actually have used that $1000 flight voucher.